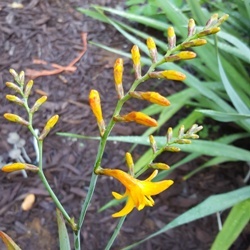 Crocosmia, with their delicate tubular or star-shaped flowers above arching stems, are bold and beautiful with a touch of the exotic. Also known as “Montbretia,” the flower spikes zigzag to 36” and bloom progressively, starting with the lowest flowers on the stems. With brilliant late-summer to early fall blossoms and sword-shaped leaves, they are ideal for cut flowers and last a long time in water. In warmer climes they will form large clumps if left undisturbed. Crocosmias are popular for their wide range of colors and hardiness. However, be sure to mulch in late autumn. Zones 5-10. 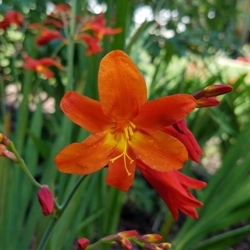 Emily McKenzie Crocosmias have large flowered, brilliant orange flowers with a red halo ring around a yellow throat with long visible stamens. 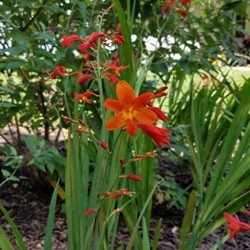 An excellent Crocosmia with long-lasting blooms both on the plant and in a vase. The bright orange flowers are easily seen and demand attention even from a distance. Semi-tender, so mulch well in colder areas. 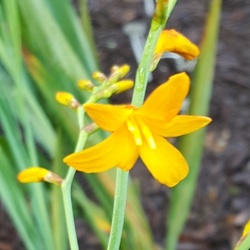 George Davison Crocosmias (also known as 'George Davidson') have small golden yellow starry blooms on arching stems. Excellent for cutting, it is among the first to flower. 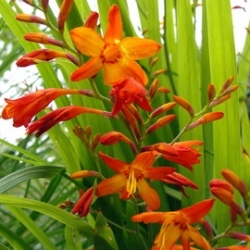 Vigorous grower – hardier than other Crocosmias. It’s also sometimes known as Golden Sheaf. 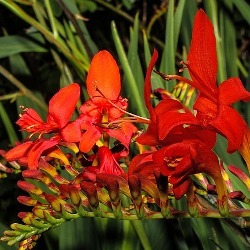 Lucifer Crocosmias is a brilliant clear red, with yellow-orange accents. Excellent in cut flower arrangements, the flowers are graceful with a tropical flair. It comes true from seed and can self-seed in warmer climates. Hardy to zone 4, but lift the corms in very cold regions to be safe.